The movie industry cannot thrive without 3D technology. The Star Wars: The Force Awakens hit theaters in 3D, becoming the first 3D film in the Star Wards franchise. Terminator 2 was presented in 3D in 2016, too. 3D tech makes movies more fantastic than ever. Now, movies buffs don't have to go to theater to enjoy 3D movies, you can watch 3D movies on Mac without 3D screen. To do this, you need: 3D glasses, 3D player for Mac, movie resources in 3D, and maybe a 3D converter for Mac. With increasing numbers of 3D blockbusters, more and more Mac media players are updated to support playing 3D films on Mac. Below we share the best 3D player for Mac and guide on how to watch free 3D movies on Mac computers. Pick up your favorite one. 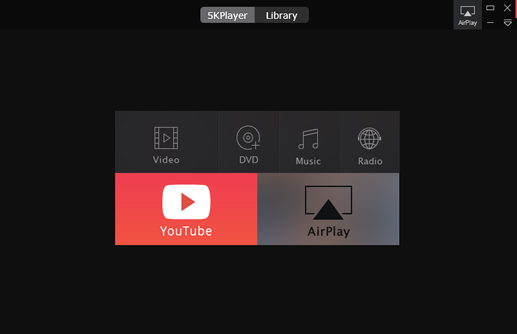 5KPlayer, a new 3D video player, lets you play 3D movies in MP4, MKV, MTS, M2TS, AVCHD, 720P/1080P, 4K UHD, any formats and res on Mac without any hassle. It guarantees enhanced image quality, cool! Better still, it is 100% free. Step 1: Free download the free 3D player for Mac and launch it. Step 2: Click "Video" icon to load your 3D movie content. And enjoy your 3D blockbusters directly. Needless to say, VLC media player deserves a place on Mac if you have 3D movies to watch. 1. 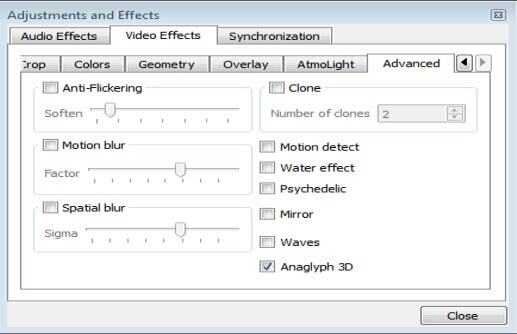 Open VLC media player, head to "Tools" on the toolbar, "Effects and Filters", "Video Effects". 2. Hit "Advanced" tab, and you can see the "Anaglyph 3D" option at the bottom, click the check mark, and "Close" button, and now you can watch 3D film on VLC for Mac. Note: VLC won't play MKV video issues are commonly complained by users. Occasionally, you may watch 3D MKV movies on VLC with black screen, freezing, audio video out of sync. Still, the 3D film players above do more than playing 3D movies on Mac, it also works as great 4K UHD 3D video players, empowering you to watch HD, 4K UHD movies, movies in 3D with the best viewing effects. Few video players can truly handle movies playback without format compatibility issues. A 3D video converter helps you get over the format limits hurdle and watch 3D movies on macOS or 3D-capable TV, phones, tablets more pleasantly. MacX Video Converter Pro does the job perfectly. It converts HD/4K 3D movies in MKV, MTS, AVCHD and others to MP4, AVI, MOV, etc with untouched output image quality. The unique level-3 hardware acceleration enables to give 5× faster conversion speed than common programs deliver. 3. Where to Find 3D Movies to Watch on Mac? The last thing you need to watch a movie in 3D: 3D movie content. If you have 3D Blu-ray discs, that's good. If not, you have many other ways to find 3D movie resources. Below we recommend you to best 3D movie content provider, best 3D movie download sites for 3D video free download, as well as a 3D movie downloader. 1. 3D movie content provider: Netflix, MovieTube, Sony PlayStation Network, Amazon, Vudu, 3D-BlurayRental.com, Comcast Xfinity 3D, 3DGo. All these 3D movie streaming services allows you to online stream3D movies at a low cost. For example, you are free to watch Netflix 3D movies on Mac only if with some tips. 2. Best 3D movie download sites: KickassTorrents, 3dmoviestreaming.com, divxcrawler.to, torrentz. You are at a risk of being attacked by virus, malware while downloading movies via online movie torrent download sites. Forget to tell you, the 3D movie converter, MacX Video Converter Pro can download 3D HD Blu Ray movies. It is fast and has no virus, spam, ads. Step 1: Free download MacX Video Converter Pro on Mac and launch it. Or grab Windows version. Then click "YouTube" icon to enter 3D movie download page, copy and past 3D movie URL to the box frame, click "analyze" button to let the 3D movie converter & downloader load the movie. Step 2: Choose movie format, res, and file size you want to download and watch. Step 3: Click "Browse" to select a folder to save downloaded 3D movies. Step 4: Click "Download Now" button to download and offline watch 3D movies in 720p, 1080p, 4K UHD on Mac. Stay here to learn how to download and watch 3D VR video with vr headsets. Download the best VR video player to watch VR video freely. This is the tutorial to download VR movies from YouTube and other video siets for playing offline.